Is this a trend? 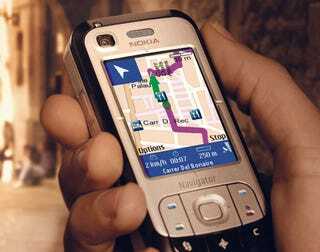 In its second GPS-enabled cellphone introduced today (see also the Nokia E90 Communicator), Nokia rolls out its 6110 Navigator, a versatile little slider handset that can not only make and take calls, but can also assist the directionally challenged. Plus, if you want some really fast data access, it has HSDPA that can give you a 3.6Mbps throughput. How fast is that? Hey, that's quick as a cable modem, at least in PR-speak. Nokia says it will give you 3.5 hours of talk time and GSM and 2.5 in 3G, but can stay on standby for 11 days if you keep your mouth shut. Should be rolling out in Q2, but it won't be cheap—with all these features packed into one little handset, it will cost you just shy of $600 without a contract.